This will be a preview LP for Killer7. We thought we would do a blind LP of this game, but then we realized that this may not have been the best idea. Watch Chip Cheezum and General Ironicus play this game way better than we ever could in their LP. This game is like watching a David Lynch movie while dropping acid and licking lead paint-covered toads. Killer7 is like watching a Pink Floyd laser show with a fever while chewing on aluminum foil. There's basically no progress in this video. Also, Chip Cheezum shows up. He'll be helping us by telling us which buttons to press to make things happen. 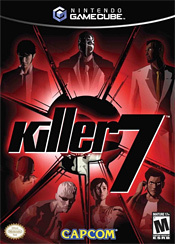 Killer7 is like lucid dreaming in a sensory deprivation tank while eating ergot-infested rye. Killer7 is like injecting liquified H.R. Giger paintings into your eyeball. Killer7 is like jumping off of a skyscraper and landing spinefirst on an oversized novelty syringe full of DMT and paint thinner.